Everyone is buzzing and it's not just a sugar high. Nope, it's about one of the best collaborations I could think of. Louboutin and Ladurée. Le Sigh. Not content with making our hearts go all aflutter with his divine shoe designs, Christian Louboutin has got together with Laduree in what must be one of the best fashion/food collaborations ever: the French designer has created gift boxes for the legendary patisserie. Delight in opening one of three beautifully decorated boxes adorned in jewel-hued Louboutin shoes and purses - the lid of which looks like someone has already got to them first with a torn trompe l'oeil effect. Inside, the flavours of the macaroons take on a Mediterranean twist, created by pastry chef Philippe Andrieu. Available from September 11, take your pick - or collect them all - from three designs and accompanying sizes. From £9.80 for a box of six. Okay, seriously, I'm tired of this. It makes me so jealous when a combo like this happens and there is no way I can be a part of it. Grrr...!!! 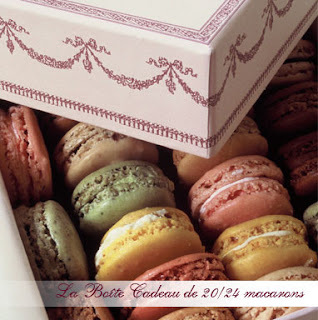 I'd love the standard Ladurée macaroons but this... this is too much! Get me to Paris stat! I've lately become a bit obsessed with incorporating more dresses in to my wardrobe. Typically I'm all about a top and skirt but ever since buying a dress with Miss WendyB in NY and then getting the francis Nautical Flag Dress (soon to be shown, I promise), I just want more adorable dresses. Well, I made the big mistake of going over to ModCloth and thinking I would harmlessly click through and see what was new. Now that I'm not really planning on shopping at Anthropologie or Urban Outfitters, I still need cute quirky clothes and, boy, does ModCloth fit the bill. I quickly ended up with 4 adorable dresses in my shopping cart. I plan on accessorizing the heck out of these with cropped cardigans, girly heels, vintage hats, hair bits I've made and maybe even giant flowers tied on with wide satin ribbons. 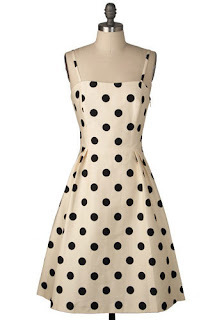 First dress is a sweet retro ivory and black polka dot with a swishy skirt. A simple classic that I know I'll pair up with a black lace cardigan or an infinite number of jewel tones in belts and heels. 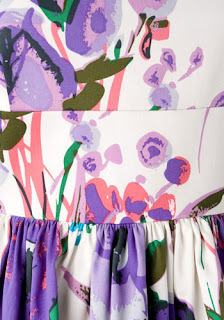 I adore this dress because of the print. I have a giant silk peony just waiting to wear with this. And I think a vintage straw purse too. While I was looking at purple, I spied this snazzy number. 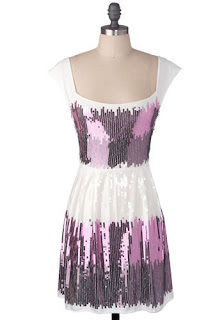 It looks so cool and breezy yet covered with ombre sequins. 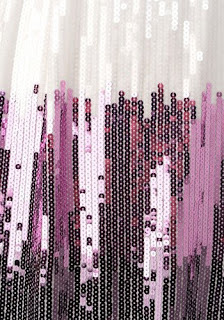 Sequins all day long... perfect! 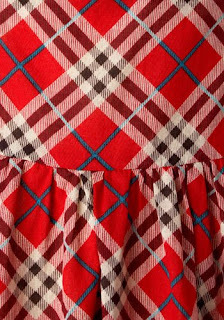 This red plaid dress is something I can't get enough of. Sort of picnic-y with parts 1950's sundress and I hope that neckline looks as good on as it does here. I was home on Saturday and got in the mood to be all kinds of crafty, so I went to the local Michaels to see if I could get supplies for a number of projects that had been rattling around in my brain. I spent the whole night making a bunch of hats and hair pieces. I promise to show the full process, but here are two I made with this dress in mind. The mini-boater was fully inspired by the Marc Jacob's boaters and vintage piece that I saw recently. I wanted faux cherries, but no luck! Maybe soon. I could make a million of these. I was considering putting this little nest on too, but in the end it seemed like too much so I made a hair comb instead. 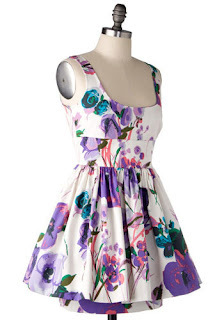 The big problem is now I'm addicted to ModCloth dresses. I have another one I'm thinking about right now. Their prices are so good it is hard to resist. 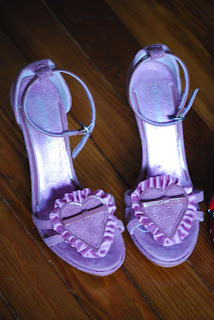 Plus they go so well with all my other girly stuff. 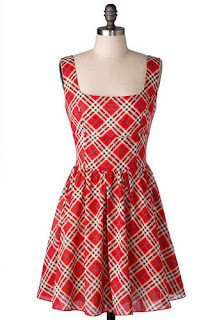 Are there any other ModCloth fans out there? Thanks Miss Elle for letting me stop by! A while back a received a nice note from a representative of the Tszuji company asking me if I wanted to learn more about their shoe storage options and maybe test out some of their shoe boxes. First of all, I have no space for a cabinet like this. I also like to baby my shoes by keeping them all wrapped up in their original boxes and, frankly, I just have way too many darn shoes to even consider this as a viable option. 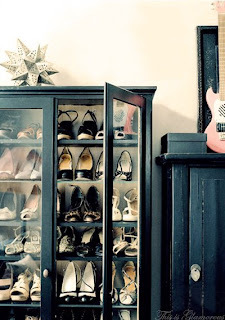 So, when asked on how I store my shoes, I admit they are in their boxes stacked up high in the closets. I have them sorted somewhat by color and having the box they came in helps me to identify what pair is what. Of course, that's not a perfect system either. I've considered doing the pictures taped to the front thing too, but I'm just too lazy to do that. Another issue is not all my shoes come with boxes. When I buy vintage shoes they don't usually come with boxes at all. To get something inexpensive and local, I've resorted to photo organizer boxes. But the downfall there is I now have 15 of the same box and it makes it hard to tell which pair is which. They are also larger than a standard shoe box which messes with the whole stacking element. So when I received these clear boxes from Tszuji I was really excited to see how they stacked up (gah, lame pun! Sorry!). The package that arrived was a flat pack filled with 6 unfolded shoe boxes. A great benefit of this over buying photo boxes is that they are much easier to store until a new pair comes along. The plastic is sturdy with reinforced edges as well as air holes for good circulation. These boxes also have little tabs that help ensure they stack well, won't fall over or slide around. And chunkier sneakers with room to spare. Tszuji also makes versions for boots and ankle boots, so check them out. But my big concern is strength. My stacks can be up to 10 boxes so it needs to be able to hold some weight. So I gave it a test - 3 pairs of shoes, including heavy sneakers, topped with my filled to the brim purse. Looks sturdy to me! The handle lays flat too but I love this because I usually carry my shoes to work in their box. I drive a stick shift car so I wear crummier shoes to drive. This makes it easy to carry my pair for the day in with me. All in all, I'd say these are a great buy. The price is good (especially if you are in the UK) and there are a lot of options. Tszuji also has a number of other shoe accessory, display and storage options, including the shoe wheel you may have seen. Thank you Tszuji for letting me give these a test run! If you leave a comment with an embedded link which points to a "deal" site or some other site, you will not get posted. I love comments that link people back to examples or relevent content but if you are a company just trying to leverage my readers, please think again. Because this week has been completely crazy here is a little something cute and funny to distract you from my lack of writing. Tonight I can take a breath! I just viewed the Style Coalition video called "Don't Shop" and immediately engaged in discussion with many other bloggers on Twitter. Concept: on June 22nd, Style Coalition hosted 13 top NYC fashion bloggers for a special video shoot at DEX New York studios for DON'T SHOP! campaign, supporting the fashion industry and inspired by DON'T VOTE! video. In a similar way our video starts with "don't shop" message, and slowly turns into campaign message showing the importance and value of supporting our favorite fashion designers in these tough economic times. Putting aside the fact that, as I work in advertising and marketing, I don't like when people copy other campaigns (let's call this an homage) I wasn't quite sure about the overall message. Yes, we are in a precarious economic time. And yes I value the work and artistry created by fashion designers, established and up-and-coming. 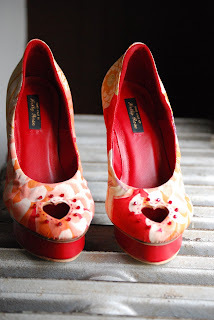 I appreciate the beauty and fun that shopping and clothes and shoes bring to our lives. I would be sad if some of my favorite designers closed up shop. That said I don't agree with what was stated here. For one, to most people the majority of the designers listed are out of reach. Even to get a single piece. I don't think that the masses are going to be buying any less than before. And for those who were buying and passionate about these designers, I think they will still buy. Maybe not as much but shopping is still going on. Consumers are actually making fewer but better/higher quality purchases. And we're not going to suddenly not have clothes either. Secondly, this is not 9/11, where people were afraid to leave their homes and travel. Heck, I worked at Walt Disney World at that time period and when the President said to go to WDW, we were happy because people were afraid to travel to populated destinations for fear of getting attacked and killed. No, right now we're in a big economic mess because of bad debt and bad lending and a lot of bad financial decisions (and other scary complicated economic things). But the biggest issue threatening high end designers and luxury houses and stores, in my opinion, isn't that people aren't spending. It's been the greed and shoddy business practices of these companies over the last 5 - 10 years. Reading Deluxe was very eye-opening. I think anyone involved or interested in the fashion or the fashion industry should read it. These brands have cut costs, thrown away heritage and craftsmanship, churned out junk, contributed to the massification of their brands and in many ways deceived the public. They have flown high on cheap leather goods, over extended their brands and misrepresented their numbers. I've seen prices on some shoes double in the last few years and it's not because of better quality materials or craftsmanship. I've actually seen that go down. And why should I keep buying from them if mass brands are getting better and the luxury brands are getting worse? If these companies want to keep my business and get me to spend with the reduced amount I am still going to spend they need to make their pieces better, make them special, make them available to me and make me feel catered to. Right now I see the opposite more often than not. I am still going to spend. There are still things I want. But I don't think I can get behind this. Frankly, I'd rather see the money and effort go to some of the charities that are struggling as donations go down. Give $5, $10, $25 to your favorite charities instead. Why yes, it is time for another Sparkler!!! And boy, oh boy (pun intended) do we have a fun new addition to the ranks! Let me introduce you to Mr. SebbyWood! This guy is fun and so busy all the time, I don't know when he sleeps! Before I start this list, I would like to make clear that I, contrary to popular belief, am a guy. I believe the first guy to be a sparkler on SD... and I'm honored. Truly, but as a believer in Female Supremacy, yes, you heard right, Supremacy, I don't know if I can list how I'm awesome, but I'll try. * I'm a guy, and am a avid reader of this blog. That's pretty awesome. 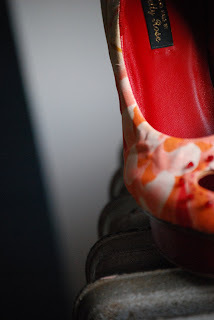 What's more awesome, is that I've taken advice from this blog, to buy my own female shoes. * I'm a guy, and am confident enough to mix and match male and female clothing. * I'm a guy, and need to point it out a lot... apparently... ha ha. * As much as I probably should, I could never hold a grudge. * I form opinions on people by only my experiences with them, and not that of hearsay. * I am on the 5th level of Prestige of Call of Duty (which means I have completed the game, 5 times. Yes, I'm sad like that). My other favourite activities include listening, learning from, producing and presenting radio. Shopping. Browsing the Internet. Shopping. Designing websites. Shopping. Filming short films and Shopping. * I have 36 pairs of shoes. Of which only 24 are male. * I am a kind and loyal friend, and would do pretty much anything for the people I consider friends. * I love radio. So much so that I am currently creating my own radio station. I have my own weekly radio show (which is also awesome) and can't stop listening to radio. * If we are out, talking, and you tell me that you haven't seen Anchorman, I will go and buy you a copy of that DVD. I think have bought about 28 copies of it so far and tell everyone to pass it on to the next person when they have seen it and find someone who hasn't. It's just a film that needs to be seen. I'm also obsessed by Ferris Bueller's Day Off. * When slightly younger (and maybe slightly more naive) I helped establish the UK Youth Parliament, as well as lots of youth councils within the UK and London. Wanting to give a voice to young people (myself being one) and wanted to be able to affect decisions being made for them without any thought about them... It's still around today, as strong as ever. * I am an amazing hugger. (Big headed I know, but isn't this whole exercise?) If you every feel down, or a bit empty, or just want a hug, I am the man with the most loving grip in the world. * I am rather proud to be called someone's muse. Their inspiration for which they grasp to be productive in their field. In this case, photography, as you can see by the pictures taken alongside this article. * I am an advocate of Wordpress to the highest level. I will preach about Wordpress to all my clients and friends who are thinking about creating a blog or website. So much so in fact, that Wordpress sent me a hoodie, to say thank you. * Most importantly, I am happy. Truly happy. I have an amazing set of friends which hasn't been easy to get, taken years in fact... and also have real drive and determination to do something useful with my life. And I wouldn't think twice to help someone get to where I am today, if I could. 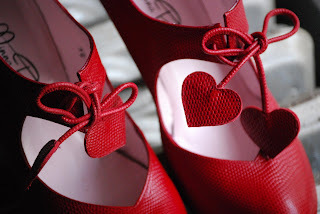 * Finally, I think I am the only male reader to this blog, who doesn't read just because of a foot or shoe fetish, which makes me pretty darn awesome as well. That's quite a question there in the last bullet. Do we have other male readers out there? Gonna speak up??? I'm curious too. I'm very very excited! On Friday night we booked a trip to Ireland in December. I'm so excited in fact that, realizing I ONLY HAVE FOUR MONTHS to plan I immediately started to think about what shoes I'm was going to need to pack. It doesn't help that I already know that I need new black boots - flat ones and heeled ones. But then I thought, welllllll...... it will probably be raining some of while we're there. I must get new wellies! 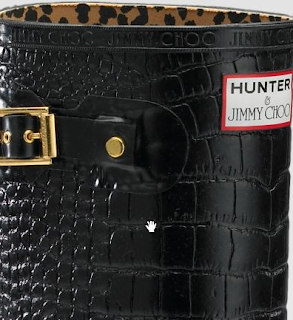 Ummm, hello Jimmy Choo for Hunter. 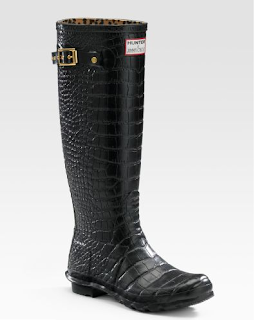 If you are not familiar, Hunter wellies are THE wellies. We're talking iconic. Classic. Royal Warrants for providing footwear to HM The Queen and HRH The Duke of Edinburgh. 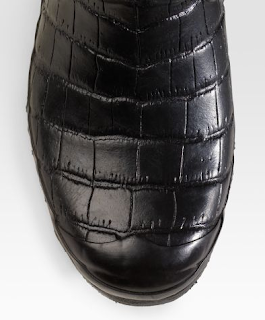 The legendary Hunter silhouette with natural rubber construction has been embossed with signature Jimmy Choo crocodile print and branded top bind. 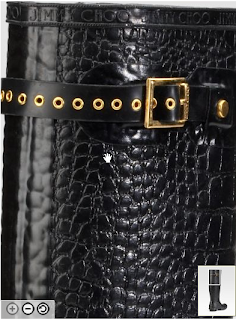 Gold buckle hardware, metal rivets and an extra long eyelet strap add attention to detail. 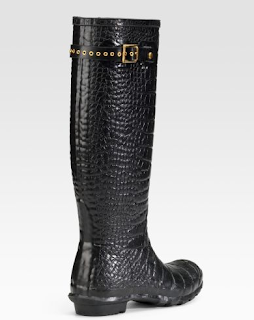 A leopard print lining provides a contrast against the black glossy rubber of the boot. Presented in the original black Hunter box and lined with leopard print, the boots have a unique identification plate, uniting the logos of these two iconic British brands. The boots will be sold exclusively in Jimmy Choo stores in the United Kingdom and the United States and online at www.jimmychoo.com. A waiting list will be available for the boots from 1st May on www.jimmychoo.com. "I was inspired by images from the festivals of the hip Brit girls in their wellies. This led to our collaboration with Hunter to produce a sleek interpretation of the British classic". Tamara Mellon, Jimmy Choo President and Founder. Peter Mullen, Hunter Chairman, comments: "We are delighted to work with Jimmy Choo to create a superbly sophisticated incarnation of our original Wellington Boot. Both brands have a strong visual identity which works well combined - the resulting Boot has a unique DNA of luxurious practicality." Anywho... waiting list, smating list. So what if they're either on back order or gone or amazingly overpriced on ebay. By the way... I love love love the buckle element. Okay, this is going to be a bit mean. I apologize in advance. I found a pair. In my (small) size left in a store. Nabbed 'em. Quite possibly they were on sale too. I'm trying not to chuckle evilly. Now, what else do I need for this trip??? I need to start planning what I'm going to pack too! 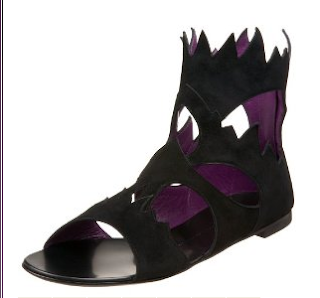 I spotted these Prada boots this evening and they made me stop and ponder for a second. 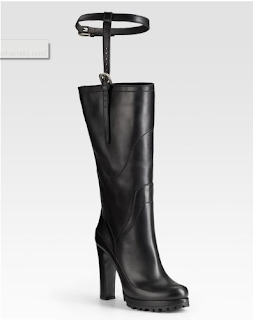 I don't really like the boots themselves but I do like the boot... "garter", buckle strap... what is it called? I know I've seen these on vintage equestrian boots... maybe even in Out of Africa... but I can't find a picture of them anywhere. Now it's going to drive me crazy! Anyone else know what they are called? 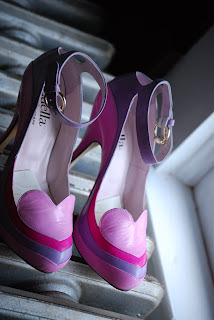 The other day I was wearing the new Luella's and recieved the Minna Parikka's and realized... 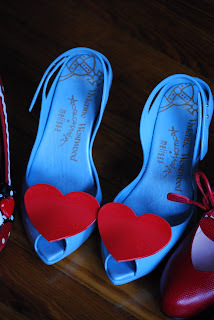 I have quite a few heart themed shoes! I like the whimsy but is this getting ridiculous??? You'll see these in other groupings but I thought I take a break from the more literal Color Studies to pull all my "hearts" out of hiding. I know I can't resist them so I just won't even try! 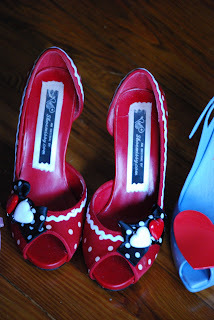 A bit Alice-y today I think - red and black and white with red hearts on my shoes. 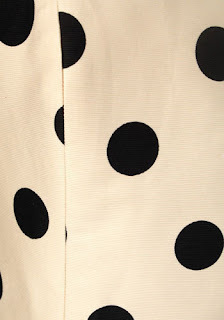 Do stripes and polka-dots got together??? My Minna Parikka's arrived all the way from Finland! I think I'm ready for another Sparkler!!!! 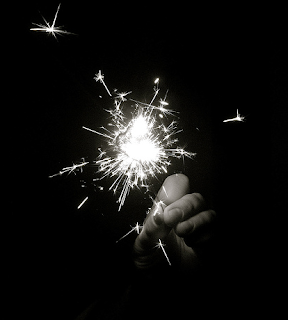 Today's Sparkler is a new friend who is very inspirational to me. Miss Mmmeg (follow her updates on Twitter for info and smart dialog) continues to grow and inform on some of her favorite topics - creating a value driven life, being frugal, minimizing waste and mindless consumption. Plus she has chickens too! * I have a wonderful husband, whom I love very, very much. We've been married 7 1/2 years (we got married young). * I'm definitely a nerd. I've had a 4.0 since middle school -- even through college. * We have two chickens in our urban backyard: Cleo and Chloe. Best eggs ever! And they're super sweet pets. * I have 5 cats, go ga-ga over kittens, know the names of my neighbors' cats but not most of my neighbors, and talk to cats I meet on walks. Fortunately, my husband shares the same obsession. We're very proud of our feline kids. * I have a deepening appreciation for "weeds", now that I am learning about edible and medicinal plants that grow locally. * I consider myself very green-minded. It's hard not to be when you start wondering if it's safe to eat normally edible plants growing wild in your own neighborhood. * I am proud of my frugality and resourcefulness -- but I am not "cheap" by any means, or even a tightwad. My motto is quality, not quantity. * We don't have any televisions. We watch stuff online & borrow DVDs from the library. We love how convenient and clutter free it is. * My mom thinks our house is "Spartan" but we love it like that. We've worked hard to declutter our house and our lives. 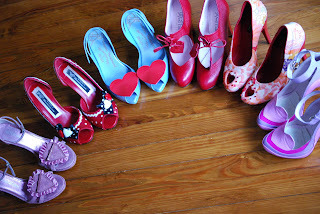 * Despite being frugal and rather minimalist, I do have a large shoe collection with many brightly colored shoes. I love color and pretty things in general. * I am a very loyal friend -- perhaps too loyal sometimes. And I always try to give people the benefit of the doubt and understand where they're coming from, even playing Devil's Advocate for strangers online. * My husband and I both sing in a college chorus just for fun. * I'm a musician. I have about a dozen instruments, though my main instrument is the saxophone, which I played in college for a while as a jazz major. * I graduated college with a degree in Latin, Spanish, linguistics, and foreign language education. I especially loved classes in sociolinguistics and what I learned in college definitely helps me in business and life in general. * I hate lawns -- especially ones that obviously take a lot of pesticides, herbicides, and gas (via lawnmowers) to maintain. * I'm very proud of my father, even though he passed away when I was 6. He was wounded at the Battle of Normandy in WWII, helped organize many things in my home community, and had crosses burnt on his lawn and worse because he was so involved in the civil rights movement. Big shoes to fill!